Anna Carolyn McCormally (Minnie Jane Scholar) sees writing and reading as spiritual processes that are essential parts of nurturing compassion and empathy. 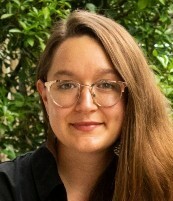 Her fiction on the themes of identity, relationships, and sexuality has been published in the literary journals Apt, The Lost Country, ROAR Magazine, and others. Anna has worked as a creative writing teacher, a bookseller, and as assistant to the Executive Secretary at the Friends Committee on National Legislation. She lives with her husband Aaron in Washington, DC and spends her time riding her bike in Rock Creek Park, sitting with friends on her front porch, and enjoying Aaron’s cooking. Anna has an MFA in Fiction from University of Maryland, College Park and a BA from Earlham College. She is a member of Herndon Friends Meeting in Herndon, VA.
Anna will spend her time at Pendle Hill working on a memoir about weddings, based on her own experiences with Quaker wedding process and marrying her partner under the care of her meeting. The book will explore the evolution of wedding traditions, as well as how the fluidity of gender, sexuality, and relationship roles influence what getting married means for individuals and their partnerships. Anna looks forward to the chance to talk with Friends about meaningful partnerships in their lives, how they have recognized them, and how those celebrations and relationships have been transformative. Doug Bennett (Cadbury Scholar) is an educator who teaches and writes about public policy matters, especially those that have a bearing on justice, freedom, and the requisites of good governance. He currently teaches at Midcoast Senior College in Maine. Doug has a B.A. from Haverford College, where he first encountered Friends, and a Ph.D. from Yale University. While teaching at Temple University from 1973 to 1989, Doug realized he had a professional vocation for the care of organizations with vital purposes. 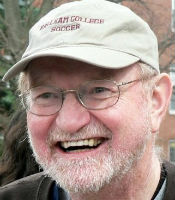 He served as Provost at Reed College (1989-1993), Vice President of the American Council of Learned Societies (1994-1997), and President of Earlham College (1997-2011). Doug is a member of Durham Friends Meeting in Maine, where he serves on the Committee on Ministry and Counsel. In the past, he has served on the governing boards or committees of Haverford College, Friends Seminary, Germantown Friends School, the Quaker United Nations Office (QUNO-NY), Friends Committee for National Legislation, and the American Friends Service Committee. His writings about Quaker matters can be found on his blog, riverviewfriend.wordpress.com. Beyond the world of Friends, he has served on the governing boards of the Center for Research Libraries, the National Association of Independent Colleges and Universities, the National Survey of Student Engagement, and the Council for Aid to Education. Currently he serves on the board of the Brunswick-Topsham Land Trust and various committees of the town of Topsham, Maine, where he resides. Doug is married to Ellen Trout Bennett, and has two sons, Tommy and Robbie. George Conyne (Carroll Scholar) was born, raised, and attended the public schools of in Bucks County. He is still a member of Wrightstown Friends Meeting there. He took his undergraduate degree in History with English Literature and the History of Religion minors at Haverford in 1979 and his law degree at Tulane University in 1982. After a judicial clerkship, also in Bucks County, he went to England and took his Ph.D. at Cambridge in 1989. Since then, George taught American History, American Studies, and 20th c. British History in English universities, principally the University of Kent in Canterbury. 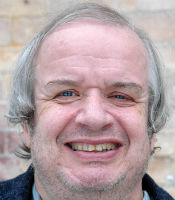 During 2009-10 he held the post of Visiting Professor in History & Law at Mississippi College. After too much administration, he retired in 2018, and has been active in Canterbury Friends Meeting, serving as Assistant Clerk and Elder until coming to Pendle Hill. George has also served on the Committee that oversees the sister city ties that Canterbury has with Bloomington, Illinois and Vladimir, Russia. He comes to us from serving as the Friend in Washington as Friends Committee on Legislation during December. He has taken up the Carroll Fellowship to start research on a book studying Friends during the American Civil War and during the Reconstruction in the years following the conflict. He expects his focus will be on the conflict between those who adhered to pacifism and those who need to fight to end slavery. This was a subject that captured George’s interest when he was very young. His hobbies include the art of good conversation, umpiring cricket, understanding foreign and American politics, and travel. George is writing a book on the topic of Quakers & the Civil War. “This book will examine a course of public events and the results when a group’s morality clashed with the contemporary public morality.” As a research project that informs Quaker history, this book will offer a clear picture of the many factors debated by the Religious Society of Friends during the period of the Civil War and the actions and reactions generated by these debates.